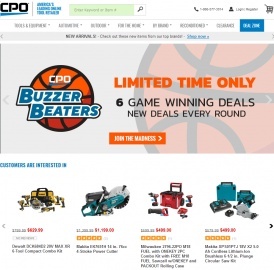 CPO Outlets partner with leading brands in the home improvement and power tool categories to sell their new and reconditioned products, plus accessories. And they're adding more top brands all the time. Click a Coupon or click Start Shopping to earn 0.8% Cash Back at CPO Outlets. Not valid on previous orders. While supplies last. Not valid on previous orders. Exclusions may apply. Continental U.S. orders only.